For the past few months, I’ve been working with the team at L/R Creative and WellSeek on this rebranding project, I am giddy with excitement over how it’s turned out! This is something I’ve been thinking about for over a year, so it’s crazy to that it’s finally real. I hope you love the new site as much as I do! On this blog, I’ll be sharing the same great recipes and wellness content as I did on Avocado A Day, but a bit more of an emphasis on wellness and diet-free living. But for this first post, I wanted to share a bit of the inspiration behind the change. Four (!!!!) years ago when I launched Avocado A Day, it was just a creative outlet on the side of my full time job as an outpatient dietitian. I had been thinking about starting a blog for years, and although many things held me back (hello fear of judgment! ), one of the main things stopping me was not having a name. When I came up with Avocado A day, I almost immediately purchased the domain. At the time, I was really passionate about moving nutrition away from calories and grams and counting and measuring and towards a more whole food focused mindset. To me, avocado represented that shift. With the old nutrition-fact focused mindset, an avocado was a fatty calorie-bomb. But of course, in reality, avocado is this super nutritious, health-promoting (and delicious!) food. When I started my blog, I secretly hoped for it to become the next Smitten Kitchen, but I never expected it to be part of my business and really knew nothing about monetizing blogs, the many roles dietitians can play in media and communications, or virtual nutrition coaching, for that matter. 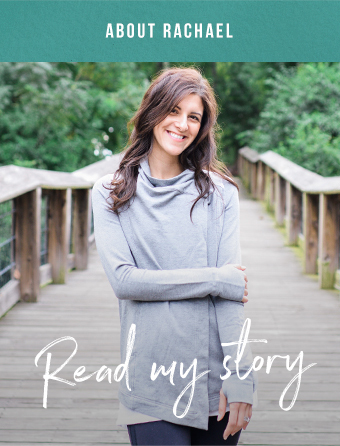 But over the years, as I launched my private practice and my blog grew into a big part of my business, Avocado a Day Nutrition didn’t feel right anymore. For one, I love what I do, and hope to be doing it a long time. I couldn’t see myself at 60 having a website named Avocado A Day (will they even have websites when I’m 60?? Or will I just appear in people’s home as a hologram to show people how to make a mushroom and white bean veggie burger?). Also, even though to me, Avocado a Day represented something anti-diet, for those who weren’t as familiar with my message, I worried Avocado a Day sounded too diet-y. I can’t tell you how many times I’ve had to explain to someone that, “no, you don’t need to eat an avocado a day” or reassure someone that we could still work together, even if they don’t like avocados (even though secretly I’ll judge them – kidding!). Although my blog provides a big chunk of my income, my bread and butter is my private practice, and I like it that way. I love writing. I love recipe development. Food photography is really fun, and I wish I had more time to devote to improving it. But I’ve come to make peace with the fact that I really don’t have the time, energy, or interest in putting in the effort to grow my blog into something huge. And that’s OK.
With all that, it made sense to rebrand, and move my blog under a more professional business website. What is The Joy of Eating? An impromptu ice cream date with your significant other or a friend, laughing together over a cold, creamy cone, preferably one with lots of chunks and chips. Grilling an easy and nourishing dinner on a hot weeknight day, with a cold beer (or ice tea!) in hand. Tasting something new for the first time and loving it….or hating it! It’s just fun to try it! Sitting down at the kitchen table to a solo meal after a long day at work. Whether it’s a thrown together salad from what’s in the fridge, eggs and toast with fruit, or greasy takeout, you’re savoring each bite. Sitting down to a big holiday meal with family or friends and leaving with a soul that’s as overstuffed as your belly. Spending hours in the kitchen, crafting a beautiful homecooked meal from specialty foods and local produce you picked up at the farmer’s market. Seeking out the absolute best of a local specialty while on vacation in a new and foreign place. In essence, the joy of eating is being free of rules, restriction, and shame about food, so you can fully appreciate the range of experiences you have with food, from the unique, to the mundane. Why do my old links not work? Unfortunately, with transferring my domain from wordpress to squarespace, each link has to be individually forwarded, so it’s going to take a little bit of time if you’ve got old links saved on pinterest. If so, just search the recipe/post on this site and you should be able to find it. Hoping to have the kinks worked out soon! Will your social media handles be the same? Over the next week or so, I'll be slowly changing my facebook, instagram and pinterest handles to reflect the new branding! So be on the lookout and if you can't find me, just click the links at the bottom of my website which will be up to date. I hope to make this space a place of inspiration, compassion and of course, joy!